I have to tell you, when it comes to going out with kids, I love my lunches or dinners to be prepared ahead of time. That way, when we get home, tired and hungry, I don’t have to think of the recipe, scan the fridge for the ingredients and spend time making the dish while kids and husband hungrily awaiting for the feast. That being said, there are moments when our outings are at unpredictable times and there is no way I can plan lunch or dinner ahead of time. Takeout or store bought meals are not my options and as a mom of 2, I have to find a way to cook simple, fast and flavorful meals that my whole family will enjoy. That’s when one pot quick meals come in handy. With the minimum ingredients, you can make a quick dish that is delicious, satisfying and without making lots of dirty crockery. Italian cuisine has always been one of my favorite because of easy and incredibly delicious recipes. One recipe, that is particularly popular in my house is Chicken Risotto. I cook it quite often and whenever we have guests over, I always get compliments for this easy Italian dish. Today, I want to share with you my favorite risotto recipe and I’m certain that it will become your favorite too. This time, to take my One Pot Chicken Risotto up a notch, I added one secret ingredient, that enhanced the flavor of the risotto making it even more tasty. I’m talking about spices. Recently, I discovered new organic seasoning mixes from McCormick. 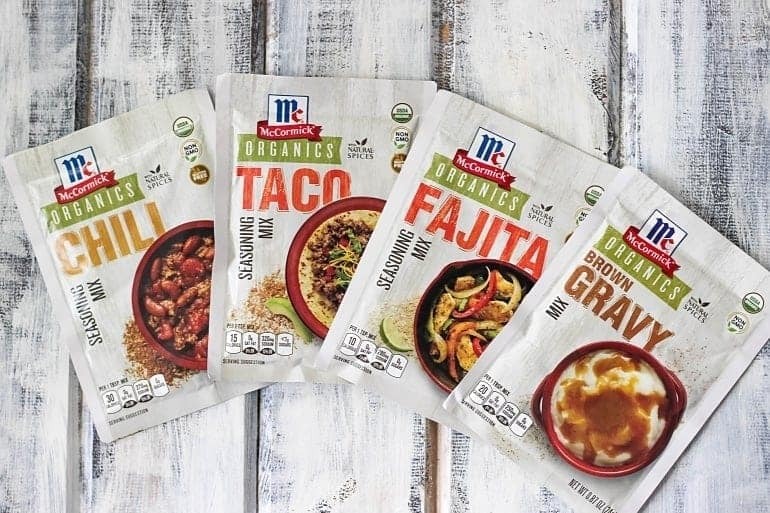 With the new flavors, such as Taco Seasoning Mix, Fajita Seasoning Mix, Chilli Seasoning Mix and Brown Gravy Mix, it’s so easy to add your favorite flavors to everyday meals. For my Chicken Risotto, I chose Brown Gravy Mix. 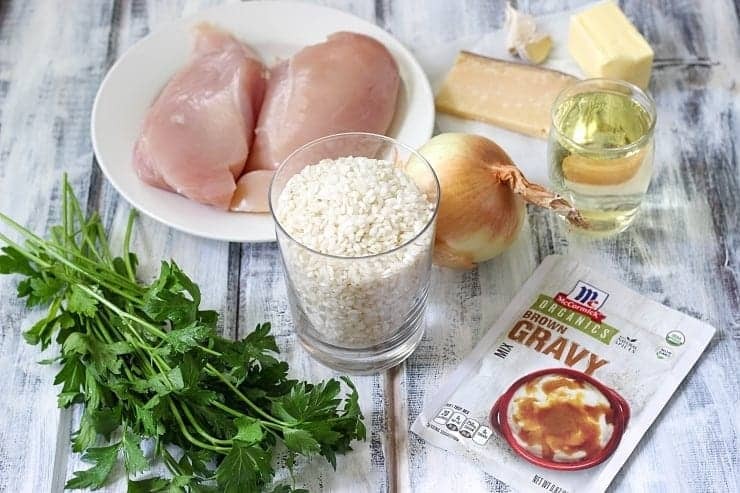 Since we want our meal nice and quick, Brown Gravy Mix will take care of delivering those awesome flavors that will make our risotto simply delicious. 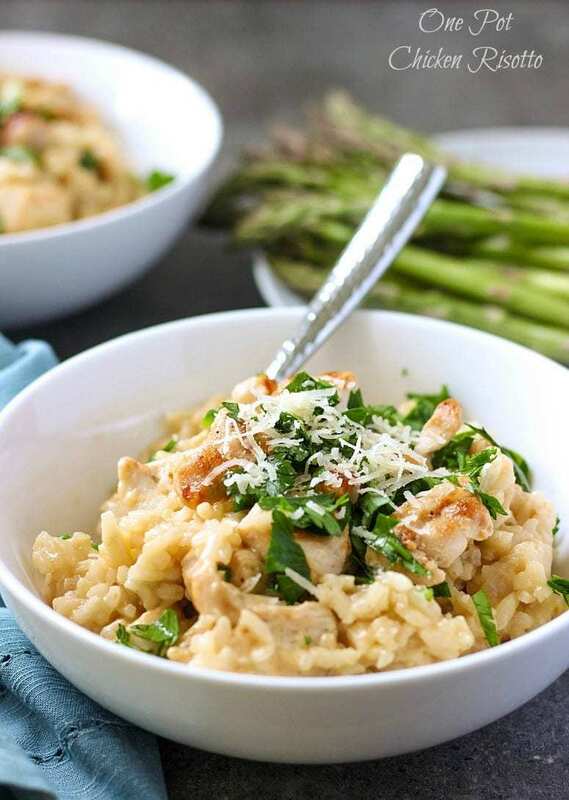 Creamy, flavorful and delicious, this easy Chicken Risotto will make a wholesome one-dish dinner your whole family will enjoy. If you’re on the lookout for the simple and wholesome weeknight dinner, give this One Pot Chicken Risotto a try and you’ll be pleasantly surprised with the amount of deliciousness of it can deliver. And don’t forget to try other flavors of McCormick Organics Recipe Mixes and let me know which one is your favorite. Heat 2 tablespoons of butter in a large non-stick skillet and over medium-high heat. Add chicken and cook until browned and cooked through, about 4-5 minutes per side. Transfer to separate bowl. Turn heat down to medium and add minced onion and garlic. Sauté for 3-4 minutes until vegetables are softened. Add rice and stir constantly until it becomes somewhat translucent, about 5 minutes. Add wine and cook until alcohol is evaporated, about 2-3 minutes. Add 2 cups of chicken broth and 3 tablespoons McCormick Organics Brown Gravy Mix. Give everything a stir, reduce the heat to medium-low, cover with a lid and cook until rice absorbs the liquid. Continue adding broth 1 ladle at a time until rice is cooked through and almost all liquid is evaporated. You still want risotto to be nice and moist, some amount of liquid should be present in a skillet. Turn off the heat, add browned chicken and grated Parmesan cheese. Serve with some extra Parmesan cheese and sprinkle with freshly chopped parsley. I always love a quick meal – and the idea of using the brown gravy mix I’m sure gives it such a fantastic flavor boost. I never would have thought to try that! Yum! I’m always looking for week night dinners, and this one hits the spot! Oh my gosh, I NEED to try that brown gravy mix. Like yesterday. What a fantastic, satisfying last minute meal! 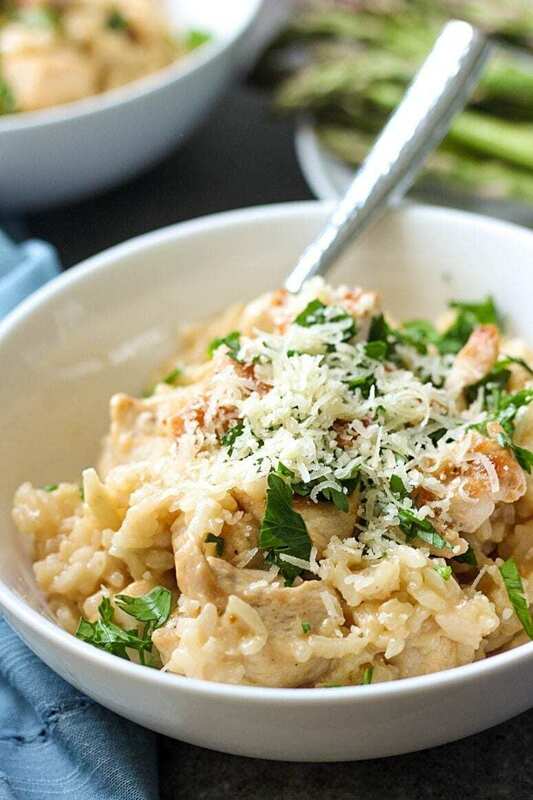 Your One Pot Chicken Risotto looks so delicious and wholesome. 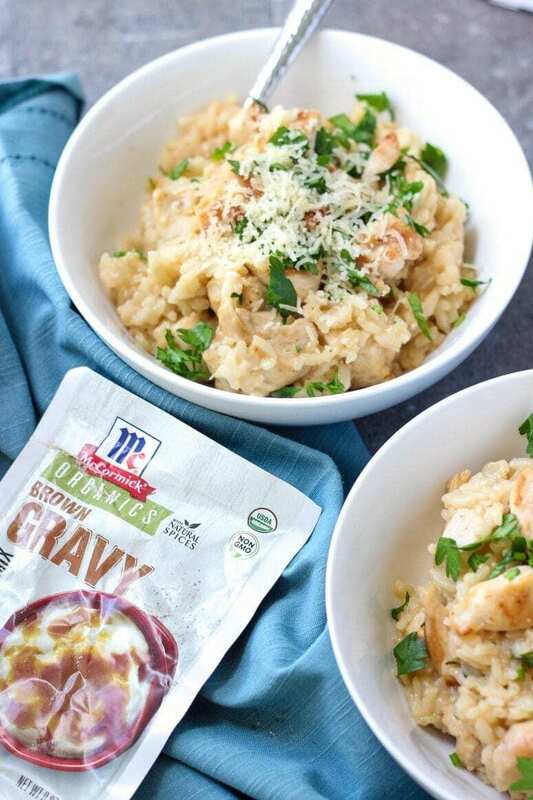 I haven’t seen McCormick Organics before but I love their original brown gravy so I’m excited to try this healthier alternative! I haven’t had risotto in such a long time, but it’s such easy comfort food. This one looks great!